Lakme Fashion Week is a fashion extravaganza and for someone like me (I consider myself to be more of a fashion enthusiast as opposed to anything else) it is one of the most awaited events of the year. 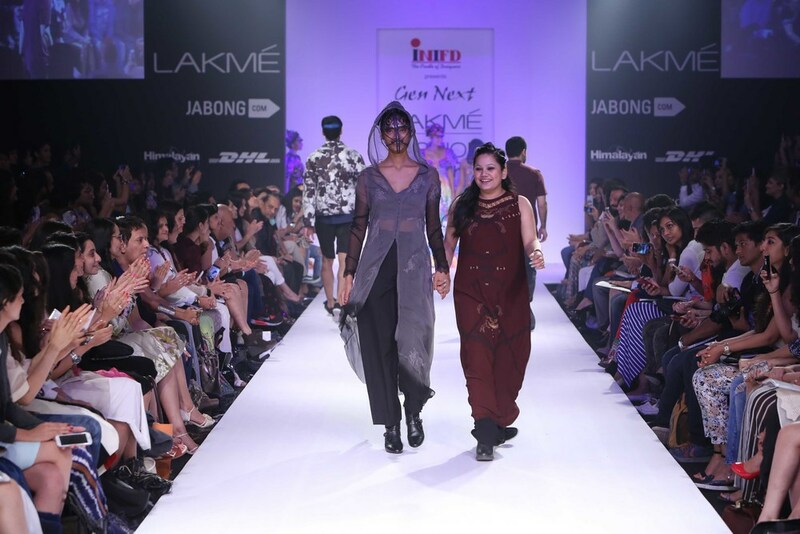 It was a full house at the Gen Next show, which is undoubtedly one of the most awaited each season. Designer Dhruv Kapoor had my attention before the show started as the audience had several faces dressed in monochrome Team Kapoor tees and the fact that his press note stated that he has worked at Etro (one of my personal favourites). The monochrome story continued onto the runway show as well with black, white, grey with a dash of pink being the colours of his choice. 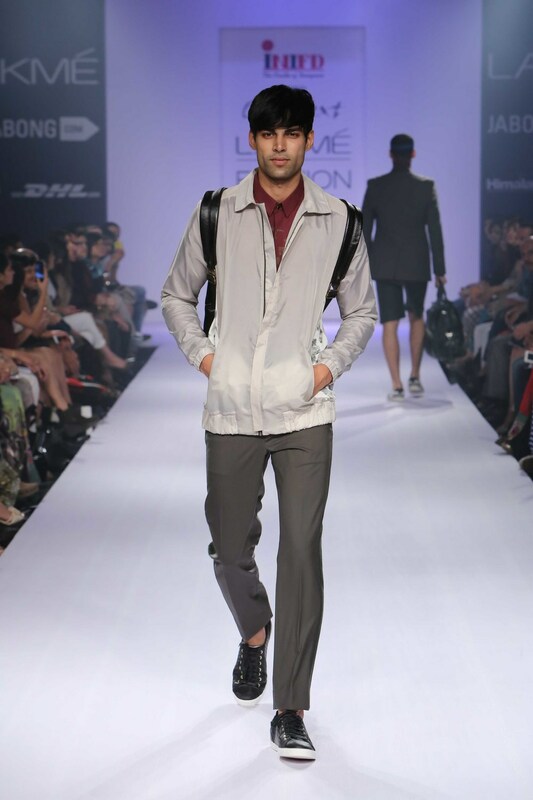 His collection can be best described as sportswear-inspired luxury, with zip closures, technical fabrics, slouchy pants and extensive use of mesh. It was nice to see industry veterans like Manish Malhotra and Anita Dongre seated in the front row and cheering the designers. Sunflowers make me so happy and thats exactly how I felt after attending this show. Yogesh Chaudhary has another winner on his hands. The collection has a range of Indian and western attire that you can have fun. One look at these vibrant peaces and you can't help but smile. So getting myself something from this 'Chandrawal' collection. 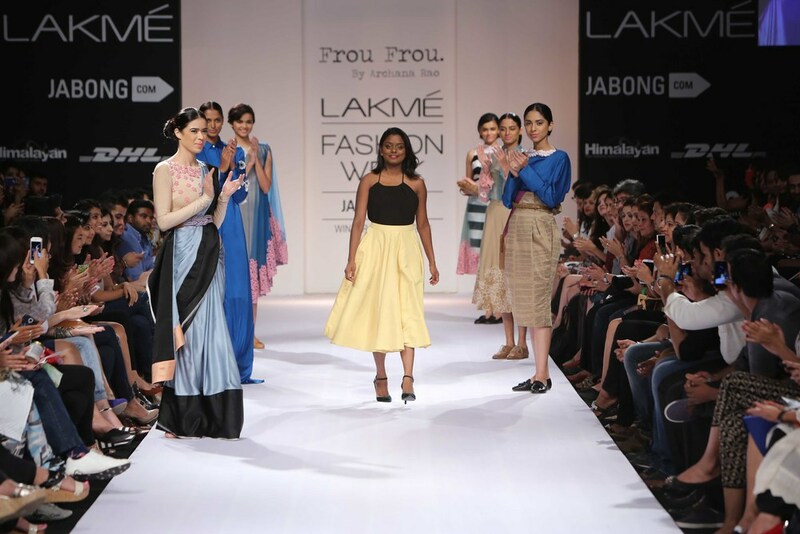 Archana Rao's label Frou Frou presented a collection called “Teaism” based on the culture of Japan. The detailing in her looks included details from a Japanese tea experience like the doilies and the vintage china sets. An unconventional yet beautiful collection. Karishma Sahani Khan’s collection ‘Khoj’ was inspired by archaeological inventions and discoveries made around the world. The most impressive element of her collection is use of natural fabrics such as organic cotton, Bamboo and soybean fibres, which are sustainable and bio-degradable. Loads of effortless layering in terms of styling. OUTHOUSE by Kaabia and Sasha is unconventional to say the least. Standout for me was the Maang Tikka designed with New with a Mohawk (Tarun Tahiliani used this piece extensively at his BMW India Bridal Fashion Week Show in Delhi). Loved the show for the dramatic start, costumes and of course jewellery. One of the most awaited shows of the day, the Pakistani designers had everyone talking. Of the three designers, Zara Shahjahan's clothes appealed to me the most personally. The collection called “Sakura” was an ode to the Cherry Blossoms. Would love to own any of the pieces. My Instagram post announcing River Island is now available on Jabong.com, had so many of my friends excited. Yes, you can now shop UK's much loved brand with just a click. The collection available online is specially curated keeping Indian tastes in mind and the runway show last evening gave everyone a glimpse of what is on offer. Kriti Sanon walked the runway as the showstopper dressed in a smart silver look from River Island. I happen to view the collection at a blogger preview and love it. Wearable and trendy separates with something for everyone's taste. From prints to solids and form-fitting to oversized :-). Also available as part of the River Island Autumn/Winter collection are the shoes and bags that were on the ramp. Jewellery designer Laila Singh's label Social Butterfly debuted at Lakme Fashion Week Winter/Festive 2014 with its latest collection, 'Flight of Fancy.' Crafted from metals and semi-precious stones the line features eye-catching cuffs, earrings, hand chains and necklaces. Kamal Sidhu walked for Laila Singh and the gowns were designed by Harsh Harsh. Anju Modi closed day 1 with a story of reincarnation called “Mahikarnika” presented by Reliance Jewels. Jacqueline Fernandez walked for the designer dressed in a magnificent, glittering lehenga with fully embroidered long sleeved choli and white net dupatta.